The H12 Washable HEPA Filter gives you top cleaning performance for all Harmony canister vacuum, Oxygen canister vacuum and the Aptitude upright vacuum cleaner. The high tech design offers a longer lasting clean by capturing 99.5% of all dust, pollen, and other airborne irritants. 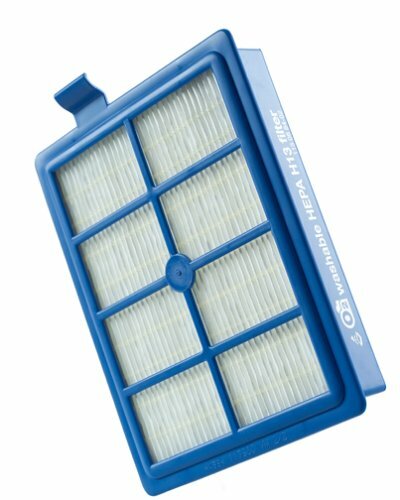 With the level of filtration you need, H12 Washable HEPA Filter allows you to clean less often and enjoy cleaner air in your home. I requested an EL012W washable filter for the Electrolux Oxygen3 vacumm cleaner. So far, I've been sent the EL013W which doesn't fit the Oxygen3 and the EL012 which is not the washable version. The filters for the Oxygen vacuum seem to do the job, it's just that the Oxygen vacuum is the worst vacuum I have every used or purchased. I can not get the various attachments on or off the wands, then the heads make the wands fall apart about 10-20 times per room - get me some duct tape please!!! I needed something lighter weight and this does meet that standard and vacuum needed allergy filtration system and it does have that. It is so falling apart inefficient and picks up almost nothing - the flooring head is too wide and long for the suction range and physically just moves the dirt around on the floor. I could not recommend the vacuum to anyone...the washable filters seem to do just fine, but since the vacuum picks up nearly nothing - I may just have a lifetime supply on my storage shelf and only purchased 2. Now after a year of trying to use the vacuum it sits in the storage closet most of the time and I make do without it.